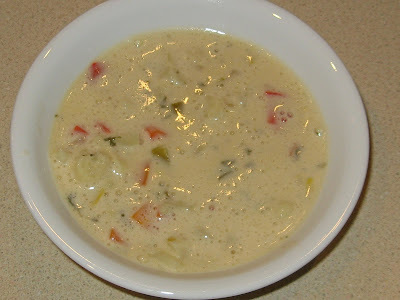 When we were at Joanne's a couple weeks ago, she made a delicious cauliflower soup inspired by this recipe, minus the half and half and sour cream. I, in turn, was inspired, bought a cauliflower last week, and came up with this recipe, with veganized cream/sour cream. We all loved it! Saute onions in 1/2 c. broth. Add carrots, celery, and sweet red pepper. Saute for a few more minutes. Whisk 3 T. flour into 1/2 c. broth and add to sauteing vegetables. Combine and stir until broth has thickened and evenly coats veggies (happens very quickly). Add cauliflower and parsley and saute for another few minutes, stirring often to prevent sticking/burning. Add remaining 3 c. broth and bay leaf. Bring to a boil and then simmer 15 minutes, or until veggies are desired tenderness. Meanwhile, blend non-dairy milk through salt until very creamy (and warm if you have a high-speed blender). When veggies are tender, turn off heat and add cream. Let soup sit, covered, for 30 minutes or so, stirring occasionally, to allow flavors to blend.